It has been described as the David and Goliath battle of our time. July 20 marks 19 years of brutal persecution suffered by practitioners of the Falun Gong spiritual practice in Communist China. On July 20, 1999, nearly 1 in 10 Chinese citizens became enemies of the state solely because they wished to live their lives according to the universal principles of truthfulness, compassion, and forbearance. With thousands of deaths by torture having been reported and mounting evidence that the most unthinkable crimes against humanity—live organ harvesting—are still ongoing in China, Australians and overseas Chinese stood shoulder to shoulder in Sydney’s Martin Place to commemorate the lives lost at the hands of the Chinese Communist Party (CCP). Speaking to a crowd that had gathered, a young Chinese refugee, Eric Jia, explained how his life has been turned upside down due to the CCP’s persecution of his family’s faith. “When I was 3 years old, the police came to my house to arrest my dad,” Jia said. Since this moment 16 years ago, 19-year-old Jia has not been able to reunite with his father. 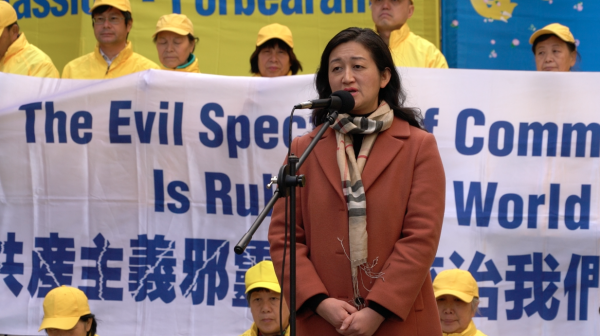 After six years in hiding to evade the state-sanctioned persecution and then eight years in a Chinese prison, Jia’s father was arrested yet again in September last year, just because he refuses to renounce his faith in Falun Gong. “There is nothing wrong to have faith in Falun Dafa. Practising Falun Dafa has brought much harmony and peace to my family. “But they have been persecuted for nearly my whole life. “The CCP used all kinds of means to make us give up our beliefs. “In prison, my father was locked up in a small dark room 24/7. He was beaten and had chemicals put in his nose. He vomited blood from time to time. “My auntie was forced to do intense labor, she was beaten and she was not allowed to sleep for 3 days. “My grandma was also beaten in prison and not given food. Over the last 18 years, Jia’s family members have been arrested and tortured on eight separate occasions. “I dream one day that they can be free and we can be together again,” Jia said. 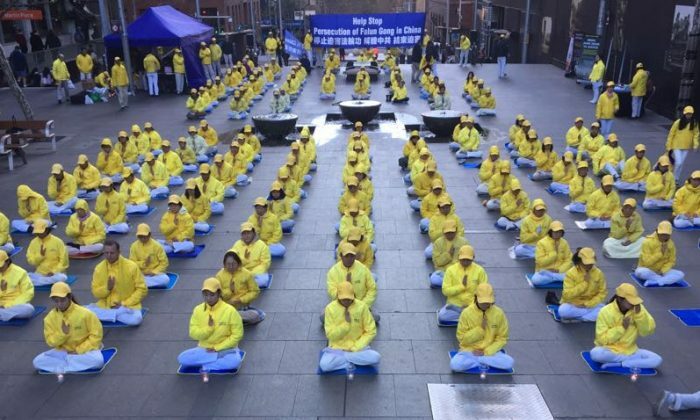 Paul Folley of TFP Australia (Tradition, Family, Property) encouraged the Falun Gong practitioners gathered at the commemoration event to persevere despite the ongoing persecution and to remain faithful to their beliefs. He said that as Australians blessed with freedom and human rights, the public can continue to wield their freedom for good by speaking out for those in communist China being persecuted by an evil regime, unable to speak for themselves. Folley called out to freedom-loving Australians: “We have to contact our politicians. “It is a great shame that certain politicians in this country, certain business leaders, have caved into this regime because of financial benefit. “But there are many people in this country who realise that money isn’t everything, and [that] spiritual values, cultural values are much more important than money. “We can’t sell our beliefs, we can’t give up our honour for the sake of trade with China. So we must continue to speak up about human rights no matter what. 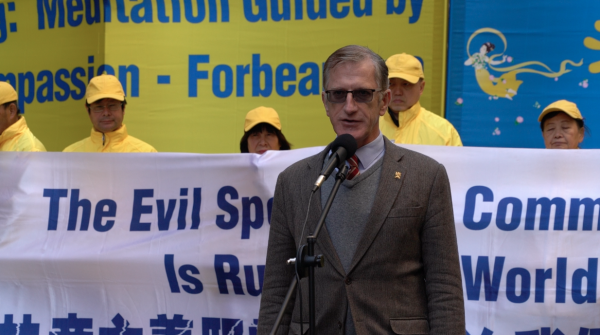 Folley added that he sees the persecution of Falun Gong as part of a bigger battle that has been fought throughout history in the name of “preserving the banner of freedom” and preventing countries falling under repressive regimes. “We will stand up with every legitimate means to preserve our democracy, our freedom, and our way of life that our forefathers gave their blood for in so many battles around the world—from Gallipoli to the western front to Kokoda to the shore of Papua New Guinea and other islands in the Pacific—where Australians fought and died. “This silent invasion by the communists is now threatening and spreading into every field in the free world, including politics, business, education, community, and media,” Zhao said. “If we keep silent to the persecution, to the invasion of communist [ideals], that will allow the evil to continue, and leave our future generation in the hands of the evil specter of communism. “Only when the good people can speak out and work together to stop the human rights abuses and to resist the communist invasion, that’s the only way to defend this free world. “That’s the reason why we’re here today, not only to call for help to support the Falun Gong practitioners in China but to call for all good people to work together to defend Australia, because the infiltration of communism is now threatening this free world. It’s actually undermining Australian values, morality, and freedom. “Please, speak out to spread these words to your friends, colleagues, and contacts,” Zhao urged.